Cardston-Taber-Warner MLA Grant Hunter has been elevated to the position of official UCP deputy party whip in August after stepping into the role on an interim basis in mid-July. “I’ll be responsible for lots of stuff that happens in the house, just helping to make sure that everybody is organized, what speeches are being given, making sure that there’s decorum in the house, making sure that MLAs are being respectful to their colleagues,” said Hunter. In Canada, a party whip is a member of a political party charged with ensuring party discipline among members of the caucus. The whip is also responsible for assigning offices and scheduling speakers from his or her party for various bills, motions and other proceedings in the house. The party whip also works to ensure that the number of MLAs in the house or at committee meetings is adequate to win a vote if one is called. The whip’s role is especially important when there is a minority government or if the government has a slim majority, as the absence of a handful of MLAs during a confidence vote could result in the defeat of a government. Hunter hopes to foster an atmosphere of respect and co-operation while still working to hold the government to account. “It’s actually a very important part of Jason Kenney’s strategy — I shouldn’t say strategy, but his belief in the way we should be treating each other. He’ll often say this is the premier we’re talking about, or a minister, we may disagree with them but we don’t have to do it in a mean or disrespectful way. So I’ll be helping with that, and helping people to remember their manners,” said Hunter. Hunter initially took on the position temporarily after Calgary-Greenway MLA Prab Gill resigned following an alleged ballot-stuffing controversy. Allegations of voting irregularities arose after the founding annual general meeting of the UCP’s Calgary-North East constituency association. Ted Carruthers, a retired judge and former president of the Progressive Conservative Party, was enlisted to conduct an independent investigation which was completed in mid-July and reviewed by UCP party leader Jason Kenney. Gill has since resigned from the UCP and will serve out the remainder of his term sitting as an independent MLA. Meanwhile, Hunter has been familiarizing himself with the communities and boundaries of the new Taber-Warner riding, which will come into effect at the start of the next provincial election in 2019. Hunter has been confirmed as the UCP’s candidate for the Taber-Warner riding, but will initially be parachuting himself in as he is currently a resident of Cardston, which is part of the existing Cardston-Taber-Warner riding but lies outside the boundaries of Taber-Warner. In his announcement to seek the Taber-Warner UCP nomination earlier this year, Hunter did express plans to eventually relocate to the Taber-Warner riding area. 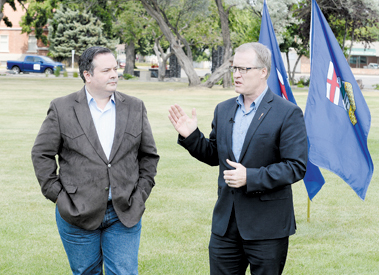 In the upcoming fall session of the legislature, Hunter suggested voters and constituents can expect to see much of the same from the UCP caucus as they have in the past.